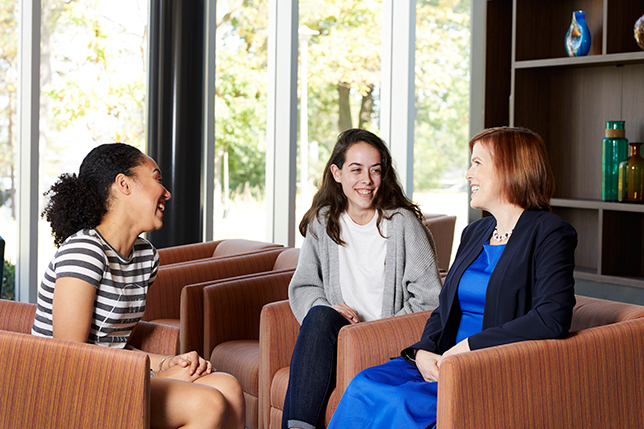 While its founding order of Ursuline Sisters slowly dies out, Canada’s only all-female university embraces a second century of empowering women. When Mary Frances Dorschell was growing up, her mother often told her the story of how she knew she was going to marry Mary Frances’ father from the moment she laid eyes on him. It was love at first sight. And her father, she said, felt exactly the same way, as though God had reached down and touched them at the same time. Oh fine, a young Mary Frances had thought. A nice story, but not particularly believable. She, on the other hand, had known marriage wasn’t in her plans since she was 11. During the long walk from school to her home at the eastern edge of town in London, Ontario, Mary Frances would think. She would think about God – both of her parents were devout Catholics – and what she would do with her life. She came to be certain she would be a nun. The next year they moved to Windsor, Ontario, where she attended the Holy Names Catholic High School. The sisters were kind and she liked them, but something wasn’t right. That sense of unease brought her, at age 16, to the only other Catholic high school for girls in Windsor. It was run by another order, the Ursulines, and Mary Frances figured she would attend for a year before joining a convent in London. But God, she said, had another idea. “As soon as I saw the Ursulines and what they were like, it was like what my mother said about her and my father: love at first sight,” she now says. This is how she remembers, more than 50 years later, the revelation that would become a lifetime commitment to the Ursuline Sisters and their founding mission to educate and empower women. That mission eventually brought her to Brescia University in London, first as a student and then, in 1982, to teach. She resided there until July 2018 – the last Ursuline living at the university. 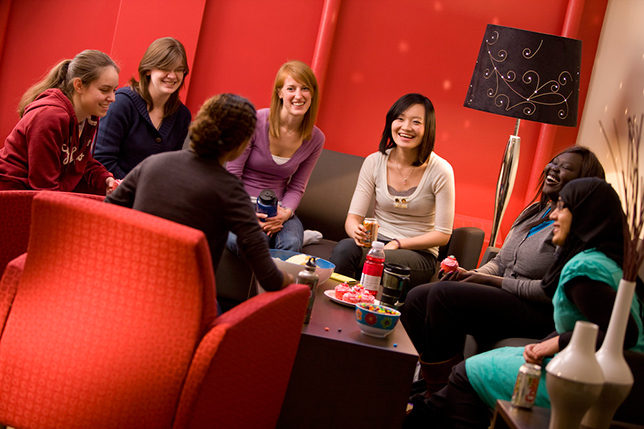 Brescia, an affiliate of Western University, holds a unique place in Canada: it is the country’s only all-female university. This year, it will celebrate its 100th anniversary, making it one of the oldest all-female institutions in North America. In both Canada and the United States, women-only colleges have seen a concerted shift to co-education: in the U.S., the number of female colleges fell from 230 in the 1960s to approximately 35 today. In Canada, Mount Saint Vincent University in Halifax began accepting male students in 1967 and Ewart College at the University of Toronto began accepting men in the 1970s before merging with Knox College in 1991. When the ambitious Mother Clare Gaukler, the leader of the Ursuline Sisters in the region, opened Brescia in 1919, she was walking down a path first laid out by the foundress of the Ursuline Order. In the 16th century, Saint Angela Merici had a spiritual epiphany. She was told to begin a society for women who would live independently and devote their lives to God. She would go on to establish the Ursulines in Brescia, Italy. 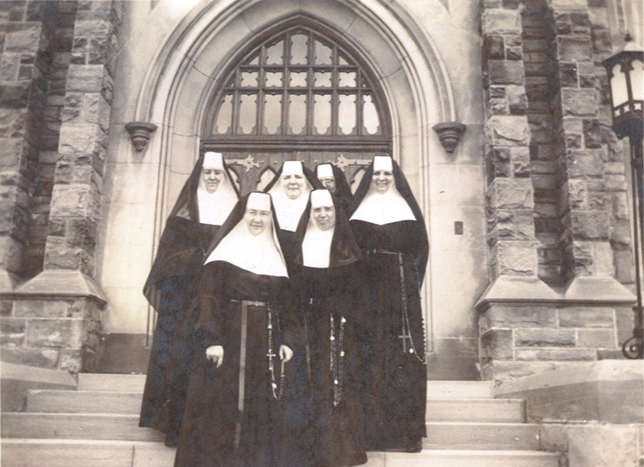 The Ursuline Sisters, standing in front of Ursuline Hall in 1936. All photos courtesy of Brescia University. But when she first came to the university in September 1994, Brescia still had a robust Ursuline presence. Because Sister Mahoney had no training as a chaplain, she sought advice from a Basilian colleague, a follower of the Congregation of St. Basil, on the main campus at Western, who said the job of a chaplain is “to loiter with intent.” Sister Mahoney continues to loiter; her office, down the hall from the chapel at Ursuline Hall, is small and sequestered, a pocket of Ursuline history in an institution that is committed to balancing its mission to be both Catholic and women-centered. Walking up the hill to Brescia’s campus, Ursuline Hall – sprawling, church-like and topped with a cross – proclaims the school’s Catholic beginnings. The local community of Ursulines, the Ursuline Sisters of Chatham, is ageing. Sister Mahoney says their youngest member is 60, and the Ursulines are no longer recruiting novices or teaching as an active ministry. Saint Angela Merici’s sacred vision, shared by all Ursulines, was to empower women regardless of their faith. It’s why Dr. Mumm sees Brescia as continuing to be relevant even in a world where church attendance is at an all-time low. Brescia has seen its international student population more than double over the last 10 years as the school has implemented recruitment strategies, particularly in Asia. As a result, it continues to draw in an increasing number of students from other religious backgrounds. Total undergraduate enrolment is up from just over 1,300 students in 2013 to about 1,550 today. Dr. Mumm with Brescia students. Despite this, some experts have expressed concern over the employability of an all-female university’s alumnae. Ivona Hideg, an associate professor at the Lazaridis School of Business and Economics at Wilfrid Laurier University, and a researcher in gender diversity, contends that all-female schools are detrimental to women’s futures in the long run. She says she fears that they perpetuate “stereotypes that there is something fundamentally different about how men and women work and that there is something fundamentally different about their innate abilities.” She sees this in the kind of courses these universities tend to offer: like most all-female universities, Brescia is a liberal-arts institution. “It’s perpetuating these stereotypes that this is what women are suited for,” she says. 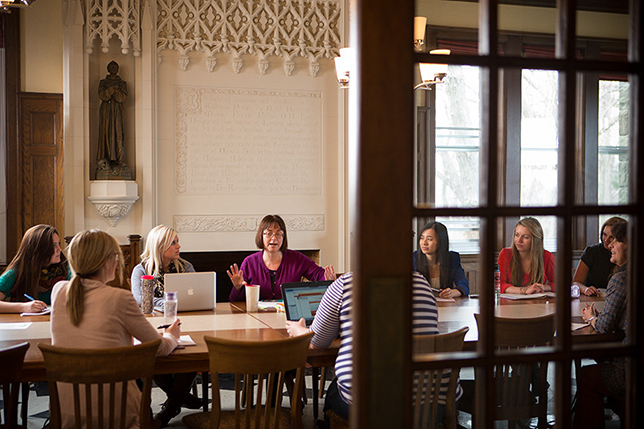 Since Brescia is an affiliate of Western, its students can take courses at Western – including those in fields that are traditionally male-dominated – but the majority of courses for their degree must be taken at Brescia. Regardless, Dr. Mumm believes the university offers more than just a degree. She calls it “voice.” It’s not that she believes that there is something fundamentally different about men and women. It’s that she has seen the difference between classrooms in co-ed schools and in Brescia. Even though universities have more female students than ever before, that doesn’t make them “woman-friendly environments,” Dr. Mumm says. She vividly remembers guest lecturing at a previous university and witnessing the imbalance in terms of which voices dominated the room. What has struck 21-year-old Brescia student Erica DeFrancisco above all is the sense of community she’s found there. When she first came to the university four years ago, she, like Sister Dorschell, was in love. The campus and smaller class sizes drew her to Western’s affiliate, but she admits that she was hesitant at first to attend an all-girls university. For both Ms. DeFrancisco and Ms. Williams, Brescia’s Catholic history is just that – historical, and not a reason to enroll in the school. Although mass is still held on most days for students who wish to attend, the two of them don’t partake. Rather, their reason for choosing Brescia was because they see it as a place where female students see women lead and come to believe it is normal. Ursuline Sisters may no longer stand in front of the classrooms, but students are still surrounded by the female voice. The world and Brescia have changed significantly, that much is obvious, says Dr. Mumm. But even as an explicitly religious presence fades from the institution, she says everyone working at Brescia understands and believes in what the Ursulines worked for. That faith continued even when the students moved out of Ursuline Hall and into Clare Hall, the school’s new residence building built in 2013 to accommodate its growing student population. It is named after Mother Clare, the first Ursuline. And though the university’s final resident Ursuline, Sister Mary Frances Dorschell, moved out last year, Dr. Mumm doesn’t think the end of her tenancy will sever the university’s ties to the past. The connection to the Ursulines runs too deep, and Brescia is too invested in a dream that she believes still needs to continue.